Description: Turn up the heat at your next event with this butane cooking fuel cartridge! Made for counter-top portable ranges, our butane fuel will allow you to cook your food and keep your food items hot and at a desirable eating temperature for your valued guests! From hotels to tailgating and other outdoor events to parties and other off-premise catering and cooking demonstrations where electricity is not available, this butane cooking fuel when used with a portable burner makes it easy to provide freshly cooked, hot food. 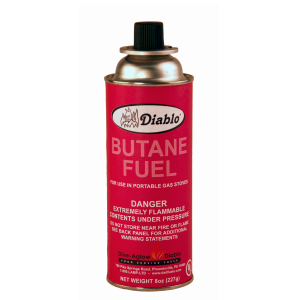 Each can of butane fuel will burn for approximately 2 hours on a high heat and 4 hours at simmer.